Present in horseshoe crab proclotting enzyme N-terminal domain, Drosophila Easter and silkworm prophenoloxidase-activating enzyme. The CLIP domain is a regulatory domain which controls the proteinase action of various proteins of the trypsin family, e.g. easter and pap2. The domain is restricted to the arthropoda and found in varying copy numbers (from one to five in Drosophila proteins). It is always found N-terminal to the chymotrypsin serine protease domain, which belong to MEROPS peptidase family S1A. The CLIP domain remains linked to the protease domain after cleavage of a conserved residue which retains the protein in zymogen form. It is named CLIP because it can be drawn in the shape of a paper clip. It has many disulphide bonds and highly conserved cysteine residues, and so it folds extensively [(PUBMED:2107028), (PUBMED:10696585)]. 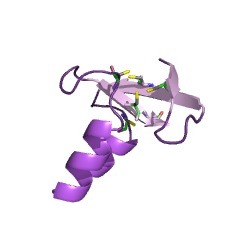 The CLIP domain is present in silkworm prophenoloxidase-activating enzyme [(PUBMED:10066809)]. There are 2050 CLIP domains in 1520 proteins in SMART's nrdb database. Taxonomic distribution of proteins containing CLIP domain. This tree includes only several representative species. The complete taxonomic breakdown of all proteins with CLIP domain is also avaliable. Click on the protein counts, or double click on taxonomic names to display all proteins containing CLIP domain in the selected taxonomic class. Binding / catalysis: Anti-microbial activity? Prophenoloxidase-activating enzyme of the silkworm, Bombyx mori.Purification, characterization, and cDNA cloning. Prophenoloxidase-activating enzyme (PPAE) was purified to homogeneity asjudged by SDS-polyacrylamide gel electrophoresis from larval cuticles ofthe silkworm, Bombyx mori. The purified PPAE preparation was shown to be amixture of the isozymes of PPAE (PPAE-I and PPAE-II), which were eluted atdifferent retention times in reversed-phase high performance liquidchromatography. PPAE-I and PPAE-II seemed to be post translationallymodified isozymes and/or allelic variants. 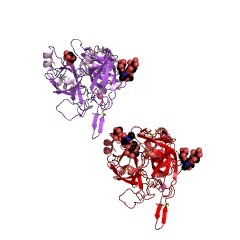 Both PPAE isozymes wereproteins composed of two polypeptides (heavy and light chains) that arelinked by disulfide linkage(s) and glycosylated serine proteases. Theresults of cDNA cloning, peptide mapping, and amino acid sequencing ofPPAE revealed that PPAE is synthesized as prepro-PPAE with 441 amino acidresidues and is activated from pro-PPAE by cleavage of a peptide bondbetween Lys152 and Ile153. The homology search showed 36.9% identity ofPPAE to easter, which is a serine protease involved in dorso-ventralpattern formation in the Drosophila embryo, and indicated the presence oftwo consecutive clip-like domains in the light chain. A single copy of thePPAE gene was suggested to be present in the silkworm genome. In the fifthinstar larvae, PPAE transcripts were detected in the integument,hemocytes, and salivary glands but not in the fat body or mid gut. Apolypeptide cross-reactive to mono-specific anti-PPAE/IgG was transientlydetected in the extract of eggs between 1 and 3 h after they were laid. Mutational analysis of the Drosophila snake protease: an essential rolefor domains within the proenzyme polypeptide chain. Two genes involved in the generation of dorsoventral asymmetry in thedeveloping Drosophila melanogaster embryo, snake and easter, encode thezymogen form of serine proteases. Mutant alleles of snake were cloned andsequenced revealing two types of lesions: point mutations which alter theamino acid sequence (snk073 and snkrm4) and point mutations which alterthe splicing (snk229 or snk233) of intron 1 of the mRNA from the normal 3'end of the intron to a cryptic site. snake mutant embryos derived fromhomozygous mothers can be fully rescued by injection of RNA transcripts ofthe wild-type snake cDNA. RNA phenotypic rescue and site-directedmutagenesis experiments indicate that snake requires the serine, histidineand aspartic acid of the catalytic triad for normal activity. Deletionexperiments show that an acidic proenzyme domain is required for snakerescue activity to be uniformly distributed throughout the embryo. 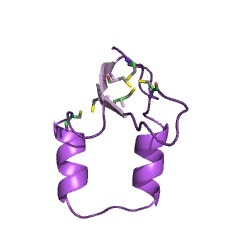 Asecond proenzyme domain, called the disulfide knot, appears to beessential for normal regulation of activity of the snake catalytic chain.Transcripts encoding only the proenzyme polypeptides of either snake oreaster can dorsalize wild type embryos. We propose a model in which theproenzyme determinants of both the snake and easter enzymes mediateinteraction between the serine proteases and other components of thedorsal-ventral patterning system. Proclotting enzyme from horseshoe crab hemocytes. cDNA cloning, disulfidelocations, and subcellular localization. Proclotting enzyme is an intracellular serine protease zymogen closelyassociated with an endotoxin-sensitive hemolymph coagulation system inlimulus. Its active form, clotting enzyme, catalyzes conversion ofcoagulogen to insoluble coagulin gel. We present here the cDNA and aminoacid sequences, disulfide locations, and subcellular localization ofproclotting enzyme. The isolated cDNA for proclotting enzyme consists of1,501 base pairs. The open reading frame of 1,125 base pairs encodes asequence comprising 29 amino acid residues of prepro-sequence and 346residues of the mature protein with a molecular mass of 38,194 Da. Threepotential glycosylation sites for N-linked carbohydrate chains wereconfirmed to be glycosylated. Moreover, the zymogen contains six O-linkedcarbohydrate chains in the amino-terminal light chain generated afteractivation. The cleavage site that accompanies activation catalyzed bytrypsin-like active factor B, proved to be an Arg-Ile bond. The resultingcarboxyl-terminal heavy chain is composed of a typical serine proteasedomain, with a sequence similar to that of human coagulation factor XIa(34.5%) or factor Xa (34.1%). The light chain has a uniquedisulfide-knotted domain which shows no significant homology with anyother known proteins. Thus, this proclotting enzyme has a mammalian serineprotease domain and a structural domain not heretofore identified incoagulation and complement factors. Immunohistochemical studies showedthat the proclotting enzyme is localized in large granules of hemocytes. This information is based on mapping of SMART genomic protein database to KEGG orthologous groups. Percentage points are related to the number of proteins with CLIP domain which could be assigned to a KEGG orthologous group, and not all proteins containing CLIP domain. Please note that proteins can be included in multiple pathways, ie. the numbers above will not always add up to 100%.